Companies that make alcoholic beverages have seen their share prices languish in recent years. Molson Coors Brewing Company (TAP) is no exception. The stock peaked at $111 in 2016 but today, trades for just $60. For beer makers in particular, the years-long trend of consumers opting for craft brews instead of the large, global brands has taken its toll. In addition, wine and liquors are increasingly popular among younger consumers, eschewing large, legacy brands like the offerings of Molson Coors. The company has been slow to adapt and has instead opted to grow its size and scale rather than focus on building out niche brands. This has led to weak share price action, but we are optimistic that the low valuation and high dividend yield will lead to strong returns in the years to come. Indeed, we rate Molson Coors as the strongest among the group of alcohol stocks in terms of total expected returns for the stock. Given that there is a number of high-quality names in the group, that is high praise. Molson Coors was founded in 1873 and in the 146 years since, it has grown into one of the largest brewers of beer in the world. Its brands include Coors Light, Coors Banquet, Molson Canadian, Carling, Blue Moon, Crispin Cider, and Miller Lite, among others. The last brand is the product of a joint venture between the Coors and Miller brands. On February 12th, Molson Coors reported Q4 earnings, and results were disappointing. Revenue declined 5% against the year-ago period in constant currency, missing expectations. Earnings-per-share did come in at $0.84 on an adjusted basis, which was in excess of estimates, capping a year of 12% adjusted earnings-per-share growth. Molson Coors has been on a journey of cutting costs in recent years as it recognized the company’s operating model wasn’t fit for a world with a sizable and growing craft beer presence. A lower tax rate helped in 2018 as well, but investors haven’t been impressed thus far. One of Molson Coors’ core operating principals is cutting costs that remain from the merger of Molson and Coors. The company saved $255 million in 2017, another $240 million last year, and expects to save a further $205 million this year. Management is focused on every step in the supply chain to cut costs as well as its brewing operations and back office support costs. 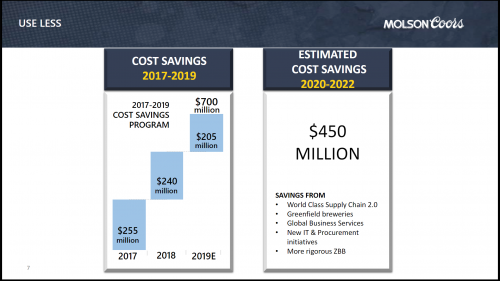 The company sees another $450 million in savings from 2020 to 2022, and we see this as a key differentiator among the alcohol stocks group in terms of margin expansion, resulting in earnings growth. Tariffs passed by the Trump administration, specifically those on aluminum imports from the European Union, Mexico, and Canada, could boost production costs. However, Molson Coors has brands in its portfolio that could pass those costs on to consumers, which should help alleviate any damage to margins that would have resulted from the tariffs. Still, it is something investors should keep an eye on in the coming quarters. Indeed, the company’s suite of successful global brands is its key differentiator and we believe the stock’s low valuation means Molson Coors is worth a look for value investors. Molson Coors trades for 12.2 times 2019 earnings-per-share estimates of $4.95, which compares very favorably to our estimate of fair value at 15 times earnings. That implies that shareholders could see a boost in annual returns of 4.2% in the coming years as the valuation reflates to our estimate of fair value. Further, we expect Molson Coors to produce earnings growth of 5% annually and combined with its low valuation and 2.7% dividend yield, we forecast total returns of 12% per year. Speaking of the dividend, we see meaningful growth potential there as well. 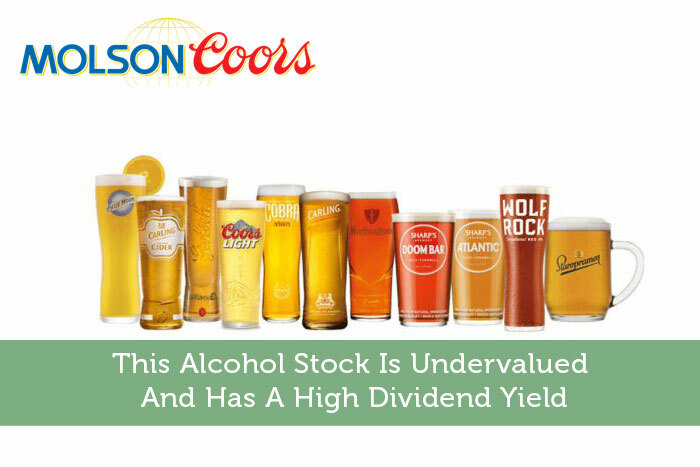 Molson Coors has a payout ratio of just one-third of earnings, meaning the dividend is very safe. The company has been focused in recent years on managing its ballooning debt levels, which it has done admirably. At the time of the merger, pro forma debt was ~5.2X EBITDA, which is very high. The company has worked in the years since the merger to lower debt to ~4X EBITDA in 2018 and a goal of ~3.75X EBITDA in the middle of this year. While there is still more work to do, Molson Coors is significantly reducing its leverage, and over time, that will not only improve its ability to grow earnings, but its ability to support dividend growth as well. The company’s stated goals for cash usage are investing in growth opportunities with the highest returns, strengthening its balance sheet, and returning cash to shareholders via the dividend. While increasing the payout is clearly third on this list of three, we think the journey to reduce leverage is in its later stages, meaning more cash will be available to return to shareholders in the coming years. The payout has been flat since 2015 and that is because the company is focusing on reducing leverage and is using cash it may otherwise have spent on the dividend to do so. However, that won’t last forever and when management is satisfied with its balance sheet leverage, it will almost certainly begin increasing the payout once again. We see the payout growing at the same rate as earnings in the coming years, creating a payout in excess of $2 per share by 2024. That number may prove to be low if Molson Coors sees better-than-expected earnings growth and/or decides to boost its payout ratio from the current low value of 33%. This company has a history of returning lots of cash to shareholders, and we think cost savings, as well as debt reduction are paving the way for future dividend increases. Molson Coors has an attractive suite of global brands with high levels of market share in their respective geographies. While the company has struggled somewhat in recent years, we think the future is much brighter given that Molson Coors is well into its journey of investing for future growth, reducing debt, and removing waste and excess from its operating model. We forecast mid-single digit earnings growth in the coming years and a resumption of dividend increases after years of stagnant payouts. With expected returns of 12% per year, we rate Molson Coors as the most attractive alcohol stock.